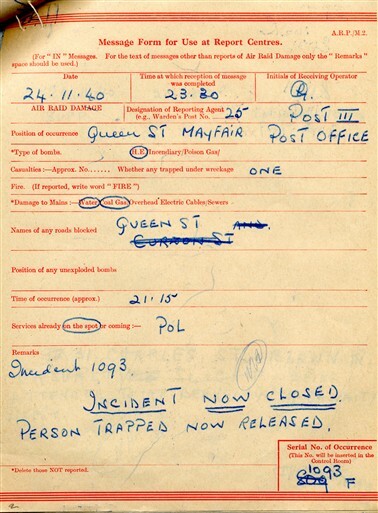 At 9.15pm on 24 November 1940 a high explosive bomb hit the Post Office at Queen Street, Mayfair W1. Fire broke out but was rapidly extinguished by the Fire Service. Right away there was concern about casualties. At 9.28pm reports indicated that wardens on site believed two people were trapped inside. 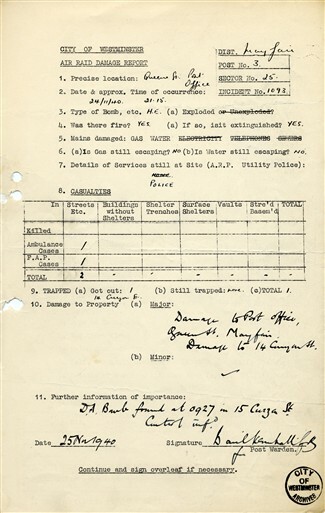 Only ten minutes later this report was amended, noting only one casualty and a person trapped at 14 Curzon Street. 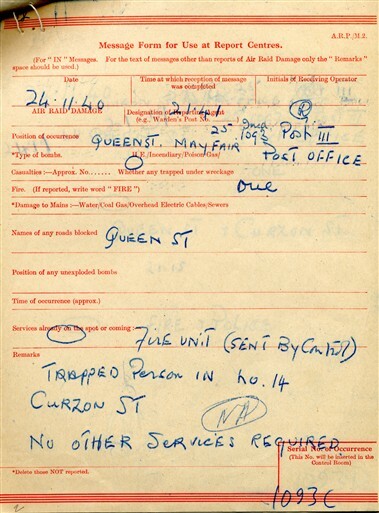 Queen Street was reported completely blocked, but no additional assistance was deemed necessary. At 9.52pm rope to cordon off the damage and trestle tables were requested. By 11.30pm damage to local mains was discovered. The ARP message indicated damage to both coal gas and water mains. The message also confirmed that the person trapped at 14 Curzon Street had been released and that the incident had been closed. 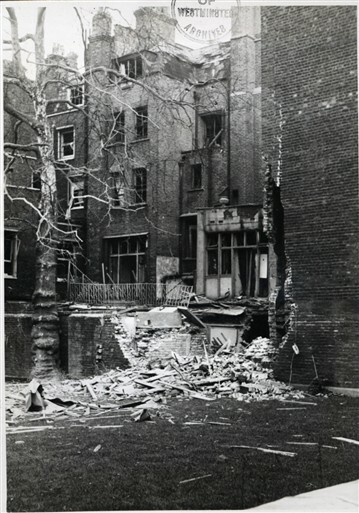 A City of Westminster Air Raid Damage Report issued on 25 November noted major damage to the Post Office and 14 Curzon Street plus a delayed-action bomb discovered at 15 Curzon Street at 9.27am. Interestingly, the Report indicated two casualties, one of whom had to be taken from the scene in an ambulance. 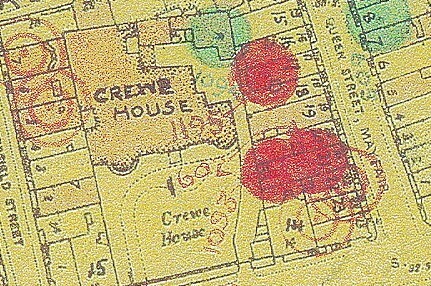 This report contradicted previous messages, showing the ever-present confusion and uncertainty in the immediate aftermath of bomb incidents. This page was added by Sarah Allen on 17/10/2013.